We have been practicing Chiropractic in Gorey, County Wexford for over seven years now. One of the most common problems we see in clinic are patient’s complaining of neck pain. And what can particularly disturb female patients, apart from the pain itself, is when they also notice the development of what can be known as a hunchback posture. Over time, poor posture may be caused by habits from everyday activities such as sitting at a desk, looking at the computer, driving, standing for long periods of time, or even sleeping. As many as 63 percent of all office workers will suffer from neck pain sometime this year, with women at particular risk, according to a recent comprehensive review of neck pain studies. 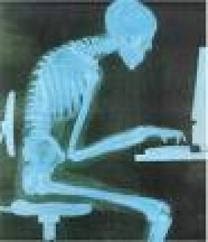 Poor posture is partly to blame for this: with an ever-increasing dependence on computers the main contributory. Happily, some of the main factors affecting posture and ergonomics are completely within a person’s ability to control and are not difficult to change. Why Does it Matter if we Have Poor Posture or if the Shoulders Appear Hunched? To begin with, we all notice it. It does not look good and we feel that our bodies are out of alignment. Something doesn’t seem right. You may not even notice it yourself. Maybe someone else notices your posture or you go to try on a top that doesn’t have a collar and something doesn’t look right…. and you would be correct. This phenomenon can happen when the spine in the neck has shifted forward. This is termed forward head posture. It can also be known as “military neck” or a “loss of cervical lordosis” or “loss of neck curve”. This represents a big problem to the spine leading to a variety of different problems including muscular imbalances, muscular weakness and stiffness within the spine itself. This can in the longer term lead to increasingly serious spinal problems. Unfortunately by this stage poor posture can easily have become second nature to us, causing or aggravating episodes of neck pain and interfering with daily living whilst damaging these sensitive spinal structures at the same time. – Kapandji, Physiology of Joints, Vol 3. So How Do We Prevent the Development of Problems Like These? Firstly, having correct posture means keeping each part of the body in alignment with the neighboring parts. Proper posture keeps all parts balanced and supported. With appropriate posture (when standing) it should be possible to draw a straight line from the ear, through the shoulder, hip, knee, and into the middle of the ankle. For those working in an office environment here’s how to set up a workstation in an ergonomically efficient way to help prevent these types of problem and maintain good posture in a seated environment. How to Create a Perfect Workstation for Both Mind and Body. Sit up straight with your shoulder blades pulled back and your chin up. Position your monitor so that the top of the screen is at or just below eye level. One study found that people who tilt their heads more than 3 percent to view their monitor have a 50 percent greater risk of neck pain. Move your keyboard so that the distance from the edge of your desktop to the J key is greater than five inches. Use a chair with armrests, which an international task force on neck pain found decreases the risk of neck discomfort. Place your keyboard so that, while you’re typing, your forearms are parallel to the floor or tilted slightly upward. The soles of your feet should rest comfortably on the floor (or a footrest) and your thighs should be roughly parallel to the floor. Remember to take a break every 20-40 minutes to get up, walk around and stretch out. Unfortunately if you are already experiencing neck pain and have a forward head posture, making these type of modifications will certainly be helpful but chances are you may need some treatment from a chiropractor or similarly qualified health professional with experience in dealing with these disorders on a daily basis. If when you stand sideways and your ears do not align over your shoulders and if you are suffering from any of the symptoms mentioned it may be time to be checked. Poor posture is a primary cause of neck pain that unfortunately may be chronic if not managed correctly. We realise it can be confusing knowing where to choose for your healthcare services. If you, a friend or family member requires care for neck or back pain, we sincerely appreciate the trust and confidence shown by choosing our services and look forward to helping you in the future. Tel: 053 94 83338 to schedule an initial consultation appointment. Opening hours Mon 8-7, Tues 9-5, Wed 8-7, Thurs 9-5, Fri 8-7. Do your feet need support from a custom made insole/ orthotic? Copyright 2019	© Gorey Family Chiropractic Clinic. All rights reserved.